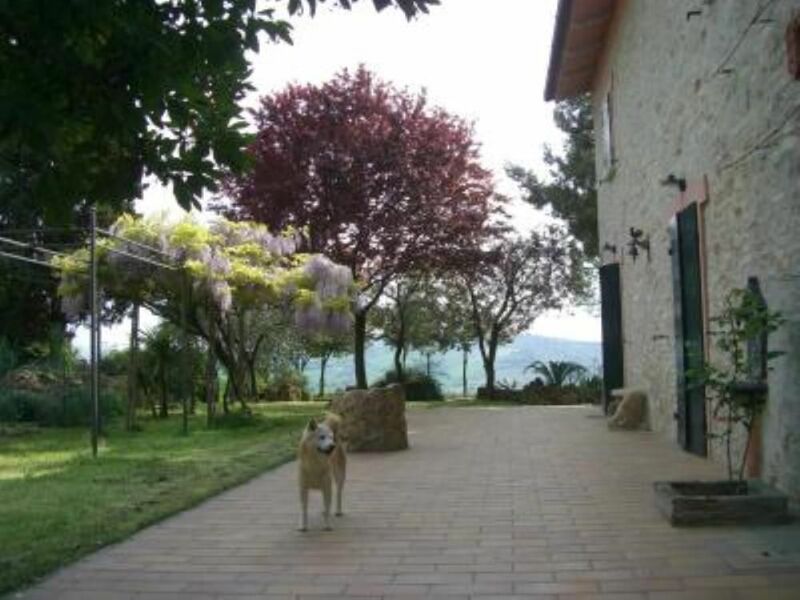 The farmhouse is located on a hill with excellent panoramic views of the surrounding hills and the Apennines: San Leo, San Marino and Carpegna; next to the balneri centers: Cattolica km 5, Gabicce km 4, Pesaro km 11, Riccione km 15, Fano km 24, Rimini km 25, San Marino 35. Adjacent to Gradara (km 3), with its castle and historical-literary references. 30 km from Urbino with its splendid ducal palace, symbol of the Renaissance civilization and declared a UNESCO World Heritage Site. fireworks, musical concerts, medieval dinners with historical re-enactment, organized by the municipality of Gradara, to which the best restaurants of the place belong. In Pesaro for many years, in August the prestigious 'Rossini Opera Festival' takes place, a representation of operas by the great maestro born in Pesaro. From July 3rd to August 30th, there are regular daily catamaran excursions from Pesaro to the Dalmatian coast: Lošinj, an island in the Gulf of the Qarnaro and Zadar, an ancient city often called 'the little Croatian Rome'. There are several theme parks: Cattolica Aquarium, Fiabilandia, Italy in miniature, Acquafan whose addresses you find them in the next entry. Our stay at this villa was just perfect. The house is clean, very well equipped and spacious enough, however we spent most of the time in the garden that is beautiful and well organized for various activities (e.g. we brought out badminton set, baby pool, and the evening barbecues on the terrace with the view the to valley were wonderful.) The owner is very kind and helpful. This house was really great: nice location, well kept, full of all you could ever need. The owner is a kind and reliable person. I definitely recommend this house for a nice and relaxing vacation in the Marche's hills (but the sea is really close, car required though). "We were very pleased with the house. It was perfect for our group of 5 adults and two boys ages 3 and 4. The house is roomy and cosy and very clean. The kitchen is well equipped and calls for cooking. The wood burning pizza oven is excellent. The place is peaceful with a beautiful view over the valley and a nice yard for kids to play. You need a car to get around. Most recommendable for families." "The villa was very clean and well furnished with good kitchen equipment. Plenty of BBQ facilities in the large garden which had wild fig trees and herbs growing. Position is on the egde of Granarola so you need a car to get anywhere. Owners very helpful and live 10 minutes away. Take plenty of anti mosquito materials as we got bitten in the daytime by tiger mosquitoes. Gradara and other hill towns in the area are lovely for sightseeing. expect to pay a for the Italian beaches." "the accomodation was everything i hoped for, clean, spacious and with glorious views. the owner was very frindlt and helpful. i recommend this property very highly." If you arrive with a car equipped with a satellite navigator you can reach 80 meters from the house and I will be waiting for you after a telephone agreement. Otherwise I will wait for you at the exit of the autostrdale tollgate. they are always open for dinner and Saturday and Sunday also for lunch. the nearest pharmacy is in Gradara. Tariffe scontate in relazione alla durata, Tariffe in funzione del numero di persone, Le tariffe indicate sono indicative per 6 persone e possono aumentare per un numero superiore e dimiinuire per un numero inferiore, Caparra richiesta alla prenotazione, Consegna delle chiavi da parte del Proprietario.